Aaron Rodgers threw for 342 yards in Green Bay’s 30-20 win over the Rams as Sam Bradford and the Rams offense was unable to do much against an injury plagued Packers defense. Rodgers has 150 career TD passes and 42 interceptions, breaking Dan Marino’s NFL record for fewest interceptions at that milestone. Marino had 69 interceptions when he threw his 150th TD pass. Randall Cobb caught two touchdown passes and Jordy Nelson had eight receptions for a season-best 122 yards and a TD for the Packers (4-3). Steven Jackson ran for his first touchdown of the year, and just the Rams’ 10th overall, to trim the deficit to a touchdown midway through the fourth quarter. 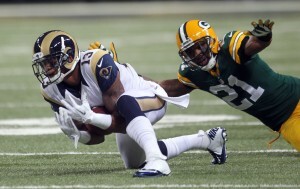 But Rodgers made a terrific throw to Cobb for a 39-yard pass that put the Packers up by two scores with 3:06 remaining. Chris Givens had a 56-yard reception for St. Louis on a screen pass in the fourth quarter, his fourth straight game with a 50-yard plus reception. Greg Zuerlein kicked a 50-yard field goal. The Rams (3-4) travel to London to play the Patriots. The team flies out Monday night.